A set of 14 doodle dividers. This set was doodled around straight lines, making them the perfect dividers for many activities. Each divider has been saved as a high quality 300 DPI transparent .PNG file. No extended commercial license is required, however these graphics MUST be used in collaboration with another project. You may NOT sell or distribute this set as is. 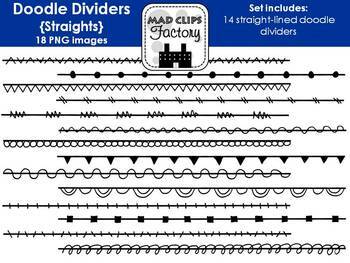 Digital Printable Files: Mad Clips Factory products may be used to create digital printable files (personally or commercially). Printed Products: Mad Clips Factory products may be used to create printed products such as stationery, cards, invitations, brochures, décor, etc. (personally or commercially). Logo and Web Design: Mad Clips Factory products can be used to create logo and/or web designs (including blog templates, headers, buttons, and store-front designs) if our graphics are incorporated into the design. You may not use or sell our graphics as is, or use as a logo by themselves. Teachers and Educators: Mad Clips Factory products may be used in digital educational resources as long as they are protected in a PDF format or saved as an image (personally and commercially).